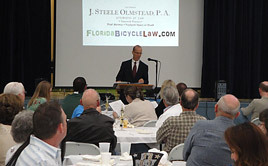 Florida Bicycle Law - J. Steele Olmstead, P.A. I am a personal injury lawyer and here I answer your questions, direct you to resources, share with you stories of bicyclists and the laws governing bicycles. I understand bicycling. My cousin Tom Godwin started The Great Bicycle Shop in Tallahassee, Florida in 1971. In 1976 my brother bought the shop and is still running it today. My first job was as a bicycle mechanic for my cousin. 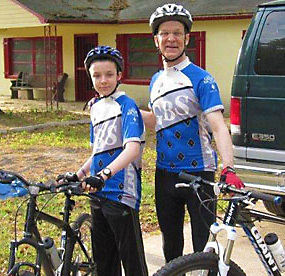 Since becoming a lawyer, I continue to do what I did in the bicycle shop: help bicyclist get back on their wheels. I drove my bicycle to class in college and used it recreationally. I drove a bicycle to law school and I drive my bicycle every week now. If you have any questions about your cycling and the law, please look under the “Florida Bicycle Law” menu tab above. If you would like to speak with me about cycling or an incident, please feel free to contact me. Claiming the Place that is Yours as a Florida Bicycle Driver. Who Do I See after My Injury from a Car Crash (“Accident”) or if I Fell?